Why was LiFT Academy created? LiFT is the vision of three moms who wanted an exceptional educational program for their own children; each of whom had learning differences. They wanted an inclusive and accepting environment where children would be free from bullying so they would have the peace to learn and grow. They wanted academic expectations placed on each and every student, regardless of their abilities and learning differences. They wanted a blend of education and life skills which prepared each child for successful independence. They took their vision and plan to two other colleagues, mothers, and friends. On January 9, 2013, these five women and educators opened the doors to LiFT Academy with 17 students. What type of programs does LiFT offer that other schools do not offer? We serve students with neurodiversities such as autism, intellectual disabilities, development delays, and down-syndrome, and more at LiFT Academy and LiFT University, in a safe, inclusive environment. 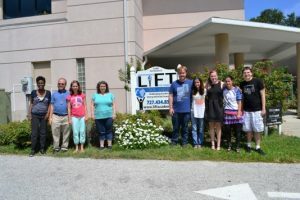 LiFT Academy is designed for K-12 students and our LiFT University transition program serves students age 18-23, who work towards successful independence through integrated academics, social skills development, intensive life skills training and career readiness through community internships. Do you have any upcoming or recurring events? “LiFT Your Spirits” at the Derby is our annual mixer and auction, with 100% of our proceeds going to benefit our students. Mark your calendars for May 5, 2018 for our Cinco De Derby Party at the Coliseum! If you are interested in participating as an event sponsor, donor, or attendee please contact Jodie Miller at jmiller@liftacademy.org. How do I find out more information about LiFT? Visit www.liftacademy.org or call 727-258-7659 to schedule a tour, volunteer, or request to receive information and quarterly newsletters.